Since late December water temperatures in Georgia estuaries have been below average and in early January inland water temperatures dropped below 44 degrees – a critical level for some marine organisms. The Georgia Department of Natural Resources (DNR) and many anglers are concerned about the status of species that support the state's valuable recreational saltwater fishing activities including spotted seatrout. "Water temperatures in the mid to low 40s are lethal to some fish species, such as spotted seatrout. We documented low water temperatures during the winter of 2009/2010 when angler reports and observation by state natural resource agency staff indicated that seatrout populations in the Carolinas and Georgia were adversely impacted by the temperature drop," explained Doug Haymans, director of the Coastal Resources Division of DNR. According to Haymans, staff are currently monitoring water temperatures coastwide as they continue to remain below 44-degrees. Even when fish are not killed immediately, they can suffer physiological stress that leads to mortality. Coastal Resources Division is requesting anglers voluntarily release trout over 18 inches in length during the period from January 10th through September 2018. 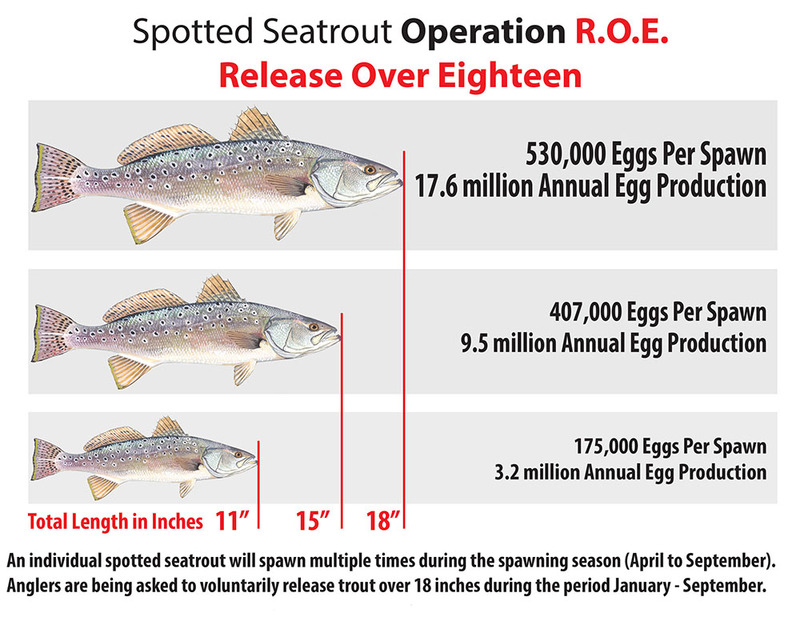 Operation ROE (Release Over Eighteen) is a precautionary effort that should protect larger more prolific spawners and result in increased egg production during the 2018 spawning season. This cooperative, angler driven effort, along with favorable environmental conditions should lead to a strong year class of juvenile trout going into the winter of 2018/2019. “The Georgia seatrout population is comprised largely of age one and age two fish - smaller younger fish that represent much of the spawning stock that are susceptible to stress during these cold conditions and suffer higher rates of mortality as a result,” states Pat Geer, Chief of Marine Fisheries at Coastal Resources. “We know that older larger fish can produce substantially more eggs and are more tolerant to cold water conditions. The spawning season immediately following such a cold event may consist primarily of the older and larger trout that survived. Protecting larger older fish following a cold winter event may help the population rebound in the absence of smaller fish that may have been lost”. Fall sampling (prior to the cold winter event) yielded above average numbers of spotted seatrout captured as part of Coastal Resource Division’s Marine Sportfish Population Health Survey. This survey is a long-term standardized survey designed to monitor the status of many popular recreationally important marine species in Georgia. This higher abundance along with proactive angler participation should help seatrout numbers rebound quickly. Coastal Resources Division will continue to monitor the situation heading into the spring spawning season.